Preheat the oven to 475 °F, and set it to "roast." If your oven doesn't have that setting, use "bake." Cut the kernels off the cob. Mix the corn with the oil, garlic, salt, pepper, and paprika and place it on the top rack of the oven. Roast for 10-12 minutes or until the corn kernels begin to change color. Drain the artichokes, chop them, and add them to the corn. Bake for 2-3 more minutes. Mix the cream cheese, mayonnaise, and butter into the corn and artichokes, and serve immediately with chips. If you prefer, put it in the refrigerator for a few hours. To save time during your party or get-together, you can make the dip ahead of time and reheat it (if you prefer) before serving. To add a little heat to the dip, add one or two jalapeño peppers to the corn before roasting. If you want a unique dip for your parties or get-togethers, look no further. 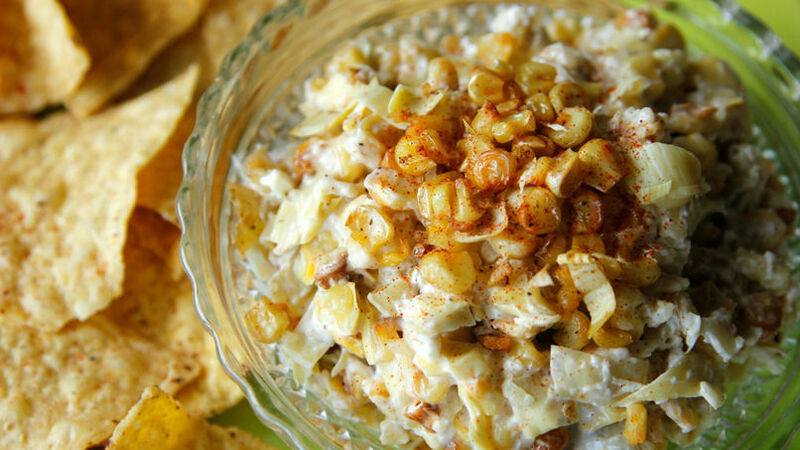 This roasted corn and artichoke dip is super easy to make, and your guests will love it. Enjoy it hot or cold, with tortilla chips, pita chips, or slices of French bread. The exotic taste of the artichoke goes well with the roasted corn and cheese. Try it out!